By some wonderful genetic gift, I know how lucky I am. That hair is my hair, and whatever color it wants to be is fine by me. A few years back I always kept my natural hair in a short cut and wore a feminine wigs whenever venturing out. That always gave me some secret agent disguise feeling – No one will recognize me, so I safe. I always told people that Rhonda was not a costume, but with the wig, maybe I was just deceiving myself. My hairdresser about 5 years ago said it was a shame to hide such beautiful hair and at the time, I was working full time as Rhonda. The wig was doing a number on my natural hair and here in Florida in the summer it was hot - as in winter hat hot. Her suggestion was lets’ add a little length here and there and see if it is full enough. It was. Wow, what a learning curve. I tried hot curlers, blow-drying, curlers, mousse all trying to recapture her salon look. I am still not an expert and do go to the salon one a week to get my hair done and a girly fix. So, to answer many requests from my readers to share my hair care regime here goes. First off, I have a fabulous stylist who gives me a great haircut every five to six weeks. I only wash my hair every other day so it doesn’t dry out using Jhirmack Distinctions Silver Plus Ageless Shampoo. It is blue - bright blue. I shampoo twice and leave the final shampoo in for about 5 minutes before rinsing. After, Jhirmack Ageless Conditioner. It is blue too - Starting to see a pattern here. All that blue leaves my hair with a beautiful white/silver look. Before blow-drying, I use a good quantity of Jhirmack Distinctions Mousse - Root Lifting or any mousse. Jhirmack is available online at Amazon and some Wallgreens. That is it. I do not sleep in curlers, and only occasionally use hot curlers now. In the morning, I just brush and fluff my hair with my head upside down. Spray as needed. Why grey? 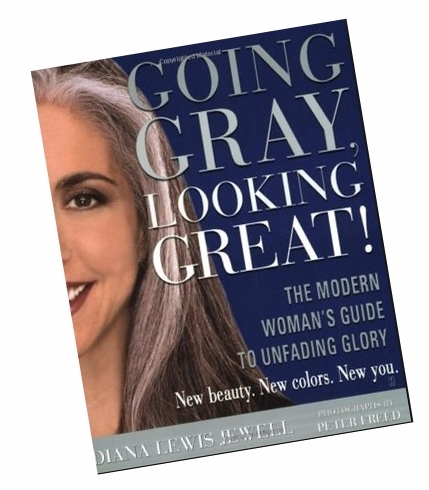 I think I have joined a growing number of real women who are “Going Grey and Looking Great”. That is the title of a book written by a good friend Diana Jewell that I purchase some time ago. The book gives good advice on hair care and what to wear and not wear with white hair. Diana also host the annual get-together of the “Silver Sisters”. See if you can find Rhonda in the Chicago 2013 group shot. I actually get stopped at the mall and ask about my hair so hiding is not an option. On-line I have found a growing number of very attractive silver sister bloggers and Pinterest has many great pins. So here I am - gray hair and all. I am still working full time so I need to keep my hair within professional limits but when I retire I think I will let it grow. It is thinning a bit but considering my age most folks would consider it go be a decent head of hair. It began turning white back when Reagan was President and is now totally gray/white. I feel the same whay when I wear a wig and hope one day soon to be out and about as a 'silver sister'. Let it grow gradually. Change the part around. Work with really good hair dresser and be honest on what you want to do. Google women with white hair and look at the images. Pinterest is equally a good source. If I didn't have alopecia, I'd grow my hair out. I hate having to wear a wig - especially in the summer! If I remember right, you are married. How do you manage things with the wife, given your hair style? She is a wonderful - understanding person - My hair can be worn both ways - More later on that subject. You are very lucky!!! Can't wait to hear more about it.